North Korean leader Kim Jong-un has been sporting the most extraordinary summer fashions on his inspection tours around the country in the record heat. 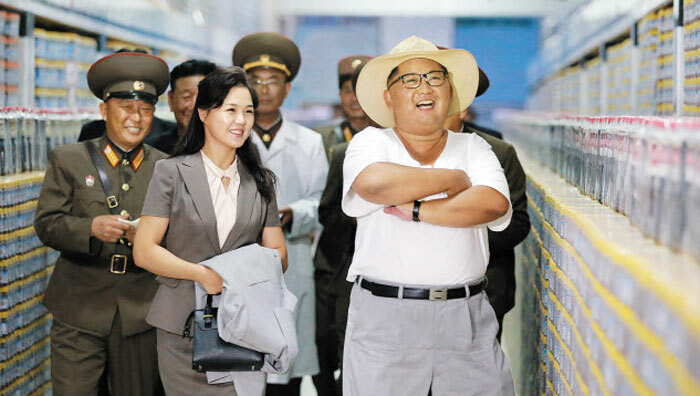 Most recently he visited a fish pickling plant run by the North Korean Army in Kumsanpo, South Hwanghae Province, according to the official Rodong Sinmun on Wednesday. He favors light short-sleeved linen shirts over his voluminous torso, a panama hat and vast tent-like trousers that often entirely cover his feet. In the latest picture he is in a kind of undershirt, having apparently taken off his Mao jacket in the heat. The overall impression is of a slightly eccentric but relaxed and approachable leader who nonetheless works tirelessly for his people. 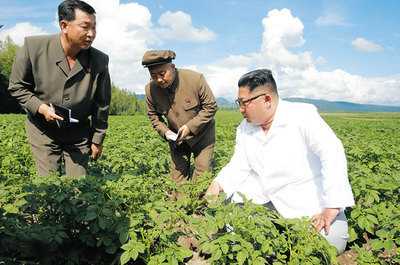 Since late June, Kim has been inspecting plants and farms in the provinces, concentrating on the economy ahead of the 70th anniversary of the regime on Sept. 9, which will be marked by huge celebrations. According to the Rodong Sinmun, preparatory committees for the event have been launched by pro-Pyongyang organizations as far afield as Bulgaria, Japan, Jordan, Lebanon and Tanzania. Some 100,000 people will be mobilized for the notorious mass games in Pyongyang. Sources say the regime is busy extorting "loyalty money" from any person who can be squeezed to pay for extravagance.